Since 1955 a publication has appeared annually that has become a feature of many Christmas present lists. It contains world shattering record after world shattering record and has probably set records of its own! So, if you want to know the tallest, fastest, longest, oldest, biggest, and not forgetting the smallest, you would consult your Guinness Book of Records. 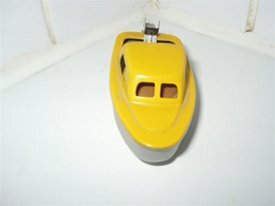 Today I would like to introduce you to a candidate for the smallest working steam boat in the world. 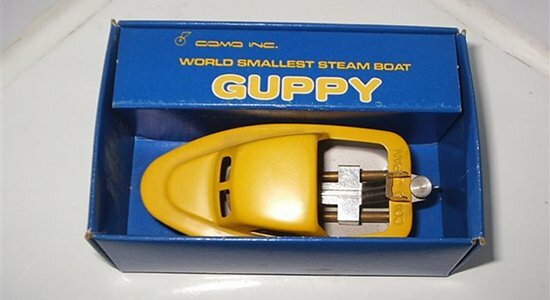 It was probably made around 1960/70’s and called the "Guppy". 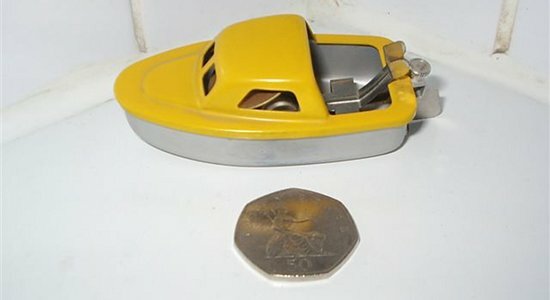 The pictures show this beautifully made tiny pop pop type boat from different angles and in its original box. A British 50 pence piece is included for size comparison. Included in the box were small candles, candle holder, water injector and an informative instruction leaflet, details from which I list below. 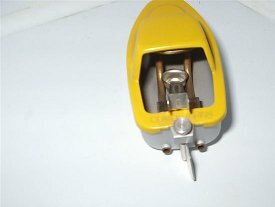 Designer and manufacturer: Como Inc. of Tokyo, Japan 166. 1/100 scale U.S. Coast Patrol Launch. Scale speed 50 knots (75 km/h). Running Time approx. 10 minutes. Construction: Fire Proof Painted Deck, Steam Engine (Diaphragm type pop pop) Tiller Knob, Rudder, Tailpipe and Satin Finished Aluminium Hull. Also included are operating instructions. It is certainly the smallest working steam boat I have ever seen and, unless you know differently, let it be recorded as such in the hallowed annals of Toy Steam News!